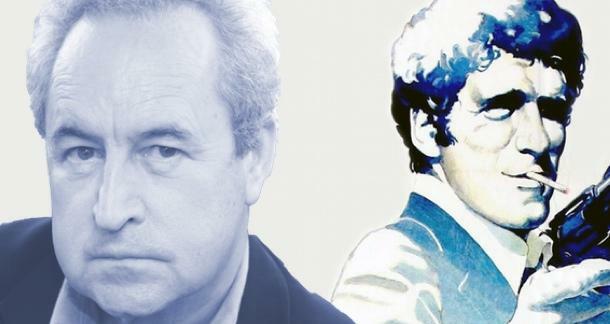 An Irishman, John Banville, who took the name of Benjamin Black to hide his dirty deeds, had written a book starring the legendary private investigator Philip Marlowe, called The Black-Eyed Blonde. As far as I knew, Marlowe was the territory of Raymond Chandler, and Chandler bought the farm long ago, a bitter old man with a thirst for the bitter drink. Banville's novel features Marlowe in full, with references to the cases of Chandler's novels throughout and plenty of hat-tips to Chandler and Marlowe's legendary legacies. The New York Times Sunday Book Review had glowing praise for the book, and with an author as prolific as Banville, there's a chance this won't be the last time we see his take on Marlowe's unique view of Los Angeles. Sean May is, among other things, an author, journalist, graphic designer, video game fanatic and feared but charming space pirate (one of those isn't true, but which one?). His fiction work has appeared in Crimefactory and other publications, and his music journalism can be found at Has It Leaked?. His novella, The Case, and a short story collection, Crimewave, can be found on Kindle. Sean lives in Carmel, IN with his wife and a cat. I saw him last night in Vroman's of Pasadena do a reading and signing. Actually, he has a local actor do the reading for him; he finds it uncouth that for an Irishman to read a Los Angeles noir aloud. He said that he wasn't opposed to giving Marlow another shot--that it fit Benjamin Black to a tee. He does have another Banville in the wings though, perhaps by the end of the year.